A hair transplant always starts with a primary consultation. 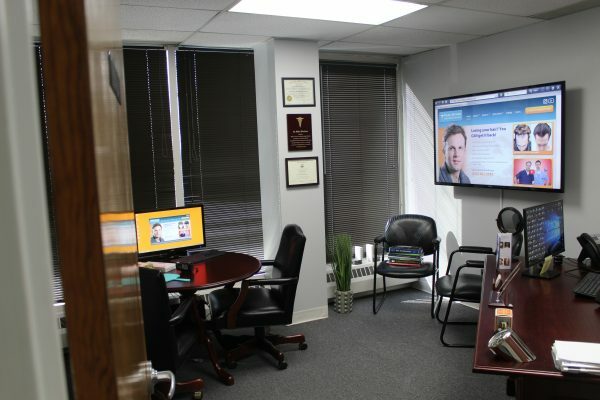 This has traditionally been an in person meeting at the hair transplant doctor’s office, but modern technology has allowed for the regular use of “online consultations” whereby photos and/or video taken at different angles of the head are sent to the hair transplant doctor via email for evaluation. Once the photos have been studied and the patient submits details of their hair loss and medical history the doctor will then offer an estimate as to how many grafts can be removed from the back of the head in a single sitting and how many grafts will be needed overall to cover the desired areas. Next, the patient will schedule for a hair transplant procedure sometime in the future and make a payment to hold that particular date. They will be told not to drink alcohol or take aspirin starting 10 days before the procedure. If a person already on prescription medication they will usually be told to continue taking the medication unless otherwise instructed by the hair transplant doctor or their own doctor. On the day of their procedure the patient will arrive wearing comfortable clothing. Unlike most medical procedures hair transplant patients are usually instructed to eat something before their procedure. This is because the doctors typically only use a local anesthetic which eliminates any pain but allows the patient to stay awake. So why by hungry?! After settling into the chair the patient’s scalp will be cleansed with an antiseptic and hair may be trimmed or cut as appropriate for the hair transplant procedure to be performed. In the cse of a Strip Procedure (also known as FUT) the hair in the back of the head (called the “donor area’) will be combed upward and taped out of the way. Then an electric razor is used to shave a horizontal stripe across the back about an inch wide, or completely shaved if an FUE procedure. The skin will then be numbed with a local anesthetic similar to what a dentist uses. It is a bit pinchy but really not too bad. In moments the area is numbed. The doctor then removes the grafts. In an FUT procedure a strip of skin is removed painlessly, in an FUE procedure they are removed one by one. Many patients actually read or use their smartphones while this is being done. In the FUT procedure the skin is then sutured or stapled closed and the hair that was combed upward prior to the procedure is then allowed to sweep down and cover the donor area. In the FUE procedure the tiny open holes are simply allowed to heal closed and usually cannot be covered by surrounding hair. Next the removed skin is given to the hair transplant technicians who will dissect the living follicles out of the skin using microscopes. This process usually takes a few hours. As this is done the doctor then numbs the thin or balding areas (called the “recipient area”). Small slits, usually no longer than about 1mm are made in the scalp. It makes a strange sound when it’s being done but is usually completely painless. Most patients have no idea it’s even being done. These are the sites that the grafts (called “follicular units” or FUs) will be placed into. At the end of the case a thin headband like bandage is usually applied along with a baseball cap placed over the head. The patient may then go home and remove the bandage the next morning themselves. Patient then takes a shower taking care to follow detailed instructions by the doctor for the next three days. After that patient may return to work and some physical exercise if they choose. If the patient had an FUT he will return to the office to have the stitches removed within 10 days. Then the patient is sent home and asked to visit at 6-8 months to follow the healing and new hair growth. By then new hair should have already sprouted and started to grow long. By 14 months most of the growth should be achieved. This hair will live and grow just as hair normally does. Patient may style and cut it anyway they want without concern. At this time the patient makes a follow up visit to their doctor. “After” photos will be taken and compared to the “Before” photos. It is at this point that the doctor and the HTW staff hope the patient chooses to share those photos on hairtransplantweb.com. They may do so anonymously by having their face covered digitally. Of course if the patient doesn’t want their photos shown to anyone their right to privacy is always respected.